The state flag of Maryland was officially adopted in 1904. The flag and the seal features the arms of the Crossland and Calvert families of the Lords Baltimore who founded Maryland and their colors of gold and black appear in the first and fourth quarters of the flag. 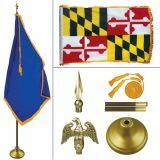 Maryland state flags are offered in various popular sizes including 3’x5’,4’x6’,5’x8’,6’x10’and 8’x12’ and in different material choices like nylon and polyester. All our flags are 100% made in USA and carry 6 months guarantee on construction. Shop from our complete line of Maryland Flags right away and avail the best prices, quick shipping and much more! 100% customer satisfaction guaranteed! Our nylon outdoor Maryland flags that are durable and lightweight are perfect for low wind areas as these will wave gracefully even in slightest breeze whereas the tough polyester outdoor flags make a better choice for heavy wind conditions and extreme weather.Made of premium quality materials, these flags that are finished with heading and grommets feature UV resistant Dupont ink imprints that will retain its beauty for a long time. 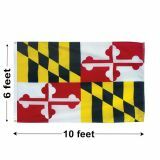 Made to theexact specifications and color choice, our Maryland flags will make great additions to your flag collection. We also have 8' Heavy Oak Indoor Flag Kit that will have everything you will ever need to put up a spectacular flag display. Right from ornaments to pole and gold tassels and more, these flags sets will impress your audience right away. Tuff Flags has an impressive collection of Maryland Flags for all your needs and budgets. Choose a model that matches your flag presentation needs and should you need any flag selection tips or assistance, call us at our toll free number (888) 287-3524 or email at customercare@tuffflags.com.